During the simulation process, I did an experiment which truly surprised me. What would happen if we picked a winner completely at random from every riding? Of course, you would never implement such a system, as it is just about the worst possible way to run an election. However, I was interested in the impact on the democratic deficit, ie. how bad would it be in terms of variance from a proportional result. I was amazed to find out that it is bad, but not as bad as you would think. I did 500 simulations using random winners, basically putting the candidates names in each riding from the 2015 election in a hat and picking one. 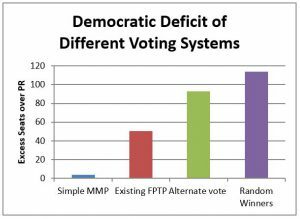 The following chart compares Simple MMP, First Past the Post, Alternate Vote and Random Winners. As you can see, Random Winners is the worst system of the bunch, but it is only slightly worse than Alternate Vote, as measured by the democratic deficit. The composition of the Parliament in these simulations swung wildly, with just about an equal number of Liberal, Conservative, NDP and Green governments (because they ran the largest number of candidates). There was always a significant number of members elected from small parties and independents. In spite of this variation, on the average 224 seats in Parliament were represented by the appropriate parties given the proportion of popular vote they received. This demonstrates the importance of lowering the democratic deficit to the lowest possible number we can. While the 2015 election carried a democratic deficit of 50.1, this number is half way to the deficit created by a random selection process. Download the random trial data by clicking here.